Some large corals have been known to consume jellyfish. However, for the first time, tiny corals have been observed working together to trap and consume jellyfish, according to a new study. Astroides calycularis corals capturing and eating a jellyfish. This behaviour was observed by a team of researchers from the University of Edinburgh when they saw jellyfish stuck to the undersea cliffs and caves near islands off the coast of Sicily. The findings of their study, conducted in collaboration with researchers from Italy, was published in the latest issue of the journal Ecology. But how do these tiny corals (Astroides calycularis) manage to capture the larger, free-swimming jellyfish in the first place? After all, the polyps are typically just four to five millimetres across (though they can sometimes be as large as eight millimetres long). The jellyfish species that the researchers observed being devoured was the venomous mauve stinger (Pelagia noctiluca) which has a bell that is three to 12cm wide. The key, it seems, is teamwork. As reported in the BBC website, Professor Murray Roberts, from the University's School of Geosciences, said this coral species seemed to have evolved to live in caves or overhangs and the jellyfish can get washed into these places when they are blooming. He continued, "What we see is that if one tiny portion of a jellyfish gets caught in one coral polyp, then the others will often be able to grab onto it as well and the whole jellyfish ends up being engulfed and then consumed by the coral." 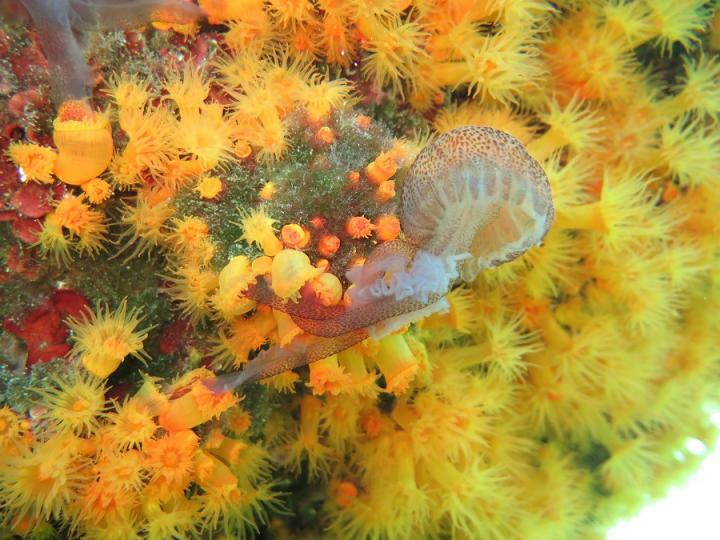 Describing it as a fascinating observation, Roberts concluded in a press release that the "conventional wisdom is that corals don't eat jellyfish, but these results show that we need to keep both our eyes and minds open to new discoveries."